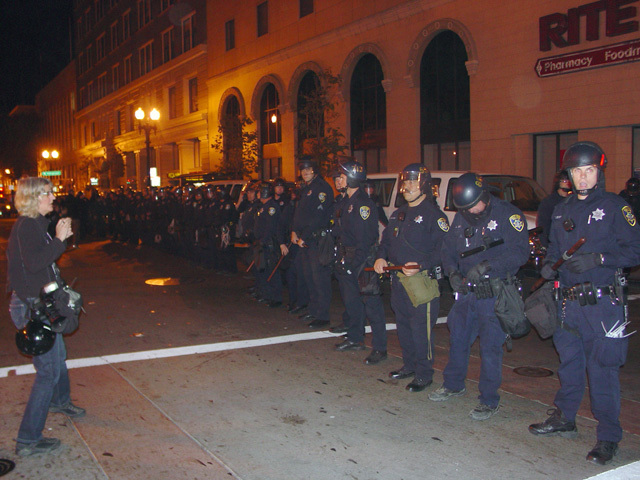 Oakland Occupy Dispersed, but then … Oakland Erupts! The Oakland Occupy, a peaceful and well organized encampment of about 200 or s o in front of Oakland’s City Hall, was violently attacked and dispersed by 500 cops at 4:45 am this (Tuesday)morning. The Oakland police, backed up by cops from 13 other jurisdictions, including UC Berkeley cops and the California Highway patrol, moved in with tear gas, flash grenades, rubber bullets and even armored vehicles. At least three people were injured, including one hospitalized with a head wound. Approximately 105 people arrested at the dispersal were still being held as of 4 pm, most charged with standard protest charges such as “refusing to leave the scene of a riot,” according to representatives from the National Lawyers Guild, who have been acting as legal monitors. These may be cited and released, but some face more serious charges, and could be arraigned this week. “This Is What A Police State Looks Like,” said the Oscar Grant Plaza Gazette, which promises to keep publishing despite the dispersal. But the dispersal was just the beginning, as this evening’s events showed. According to news reports, another hundred or so arrests have been added tonight, charges as yet unknown. After the dispersal, a rally was called for and held at 4 pm on the steps of the main Oakland Public Library on 14th St, several blocks down from the Occupy site (which was now barricaded off and guarded by cops). The library was significant, since the Occupy and other protestors have sharply opposed the recent threats of Oakland’s “left” liberal Mayor Jean Quan to close libraries, a threat which was used to force concessions from city workers. On an Occupy support march, which wound its way through Oakland’s streets last Saturday to protest the threatened dispersal, marchers stopped in front of the library and chanted, “Shut down OPD, not the public library,” to smiles and cheers from library workers. Then today, as the rally formed up, we were told that the the Oakland PD had asked the library to close its doors in advance of the expected rally. Library workers proudly refused to do so, to cheers from the crowd. Jed Brandt writes: His name is Scott Olsen. He's a 24 year old former marine, served 2 tours in Iraq. 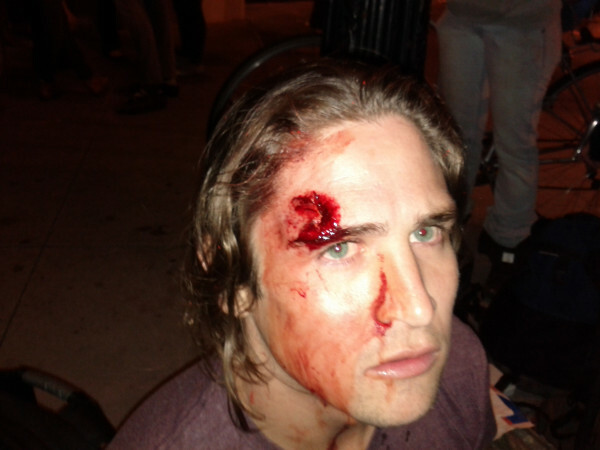 Then, in Oakland, he was struck in the head by a teargas canister that the Police likely fired at him, fracturing his scull. When people tried to help him, they were shot with rubber bullets and flash bang grenades." He is a member of Iraq Vets Against the War. There are no excuses Mayor Jean Quan and OPD! While all this was going on, many marchers had moved on up the block, and once again made a turn to avoid a second and more formidable line of cops, complete with motorcycles and patrol cars, guarding the jail. The Occupyers’ principle of consensus and no leaders seemed to alternatively work well, and then break down into disorganization; but then it usually picked up and found a united path again. In this instance, while some marchers were shouting “let them go” and surrounding the cops, others were trying to get marchers to move on, not realizing that the cops had two prisoners down on the street. For a while marchers were separated into two groups, but then, the second line of cops moved in to rescue their now paint-spattered brethren, and all hell broke loose. This was the first battle of the evening, as police opened fire with flash-bang grenades and tear gas. The police then retreated with their prisoners, and the marchers reconnected and decided to keep moving, this time heading toward Oscar Grant Plaza, as darkness began to fall. That set the pattern for most of the night. When we arrived at the site of the former encampment, it was barricaded off and guarded by a solid line of cops. (And City Hall was closed, even though tonight would have normally been a council meeting.) Protestors pushed up to the line, but very soon a sergeant was on the horn. “This is an unlawful assembly. If you do not leave the designated area within 5 minutes, you will be arrested. Chemical agents will be used. 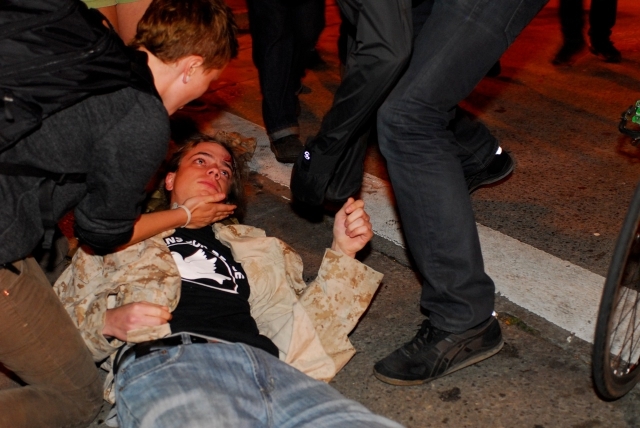 You could suffer serious injury.” Just as the police were about to unleash a barrage of tear gas, protestor consensus worked again, and the march took off up Broadway and then swerved to go up Telegraph Ave. to avoid yet another line of cops. The spirit and determination–and the numbers–of these protestors was impressive. One young marcher said to me, early in the march, that he’d been to several of the other Occupys around the country, but except for New York, Oakland was the only place that could produce a large protest such as this on the very next day after a police dispersal of their encampment. As for consensus and “99 percent?” Those concepts will inevitably give way to a process of sorting out. The bulk of the Tea Party, the police rank-and-file, and Mayor Jean Quan are all in the 99 percent, as it is being defined. The General Assembly of the Oakland Occupy evolved, in its 2-weeks so far, a view of the police as the enemy who needed to be kept out of the encampment, and a decision-making process that involves a quorum of at least three to present a proposal, and a super majority (but not unanimity) to pass one. For now though, the great value of this movement is that its aim is quite good. The one percent of Wall Street barons, the financiers who are the very peak of the imperialist ruling class, is exactly the clique that needs to be overthrown in a working class revolution which would expropriate, not just control, the banks. The aim is good, but the revolutionary consciousness is not quite there yet. Still, the consciousness is a bit better than what is suggested by one sign that I saw being held up at the library rally earlier today. It read, “Mayor Quan, and Oakland Police – Which Side Are You On?” I smiled and said to the sign holder, “I think they’ve already answered that question.” He smiled back broadly, but still held the sign. The Pacifica National Board wishes to express its strong condemnation of the actions of Oakland Mayor Jean Quan and the Oakland Police Department for their brutal eviction of the peaceful protesters at Frank Ogawa Plaza on the morning of Oct 25. We call for the formation of an independent committee of inquiry to investigate the conduct of the Oakland Police Deparment and the other uniformed services that were involved in the eviction of the protesters at Frank Ogawa Plaza [Oscar Grant Plaza]. Occupy Oakland did not back down, and vowed to be back every night, determined to take back Oscar Grant Plaza for the people’s use. Reports of solidarity actions in Boston, NYC, and elsewhere. Egyptians planning to march in solidarity on Tahrir Square on the 28th. Today the City of Oakland backed down, and tonight thousands gathered, took down the fences around plaza, and are re-occupying it. The General Assembly began with 3,000 people. As a person disabled by chemical injuries, I unfortunately cannot be there in person yet, because of the residues from the chemical weapons they used, but I will return there latest after rain washes the residues away.